Fancy Bands™ Custom Themed Soccer Garters or Custom Themed Golf Garters are offered on White or Black Lace. Custom Themed Soccer Garters are in Team Colors or Black and White Band and Bow along with Double Soccer Balls attached. The Custom Themed Golf Garters available with your choice of Golf Club or Golf Ball and Tee attached. 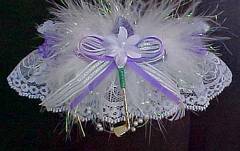 These Golf Garters are embellished with Opalescent Marabou Feathers, a Double Bow with a Deluxe Flower, and Floating Pearls.